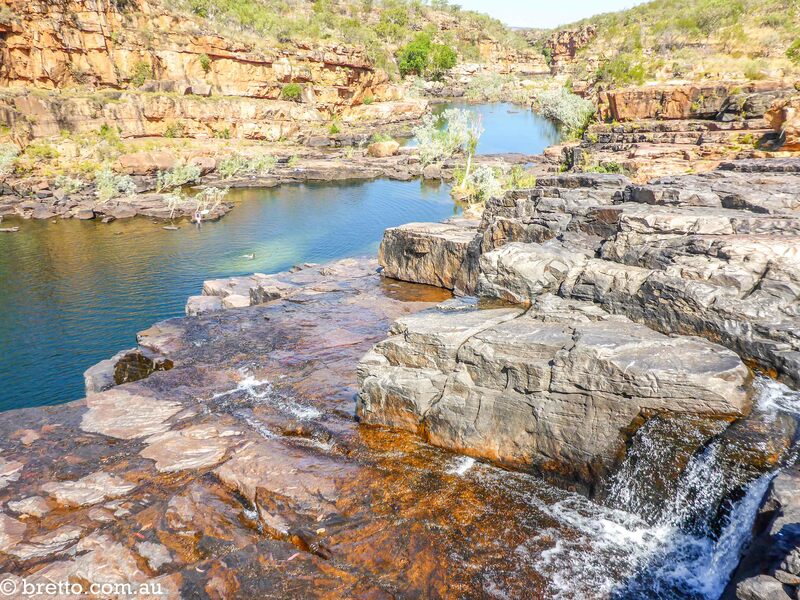 The last few weeks have been filled with scenic gorges, amazing swimming holes, lots of dust and endless kilometres of corrugated roads. 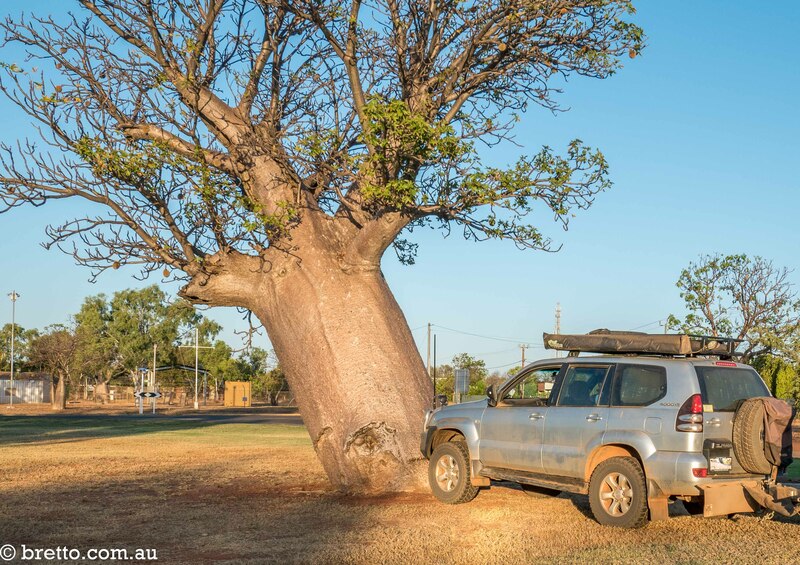 This post covers our time in Litchfield National Park in the Northern Territory and the Kimberley in Western Australia including the Gibb River Road (GRR). 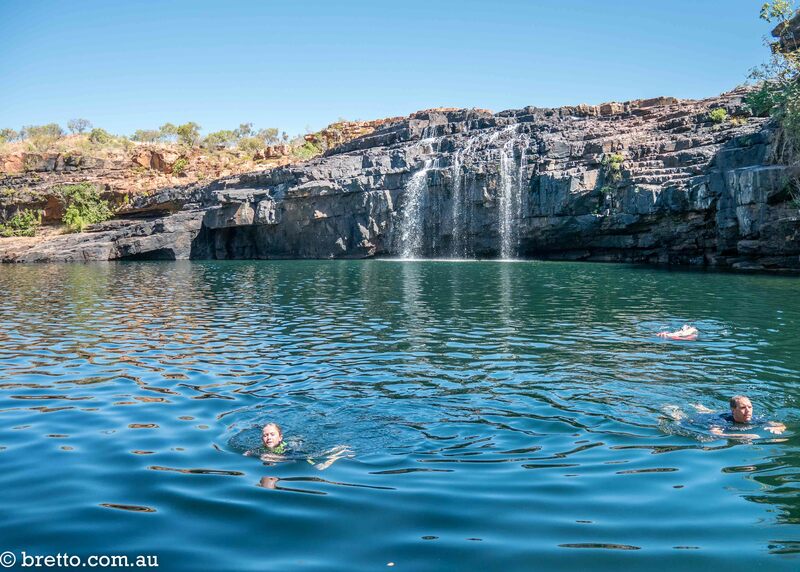 The Buley rock holes at Litchfield offered great swimming in a number of small pools. 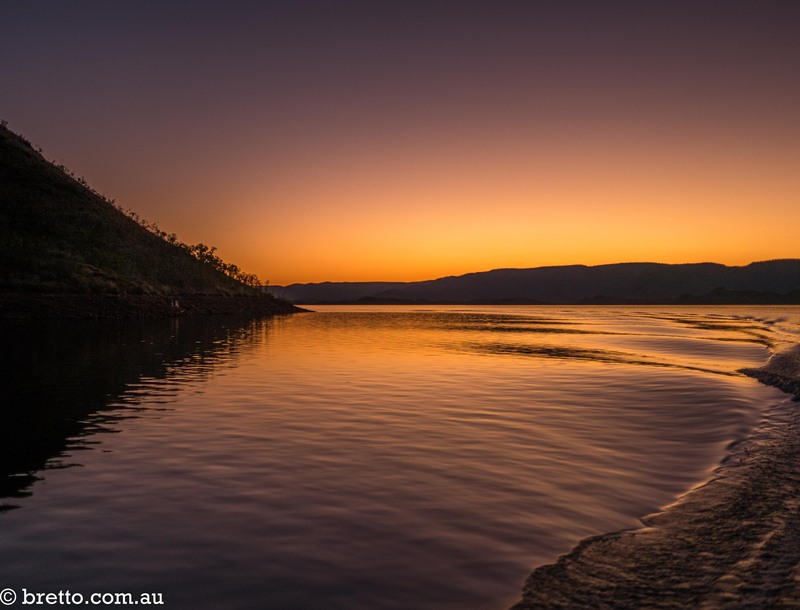 The sunset cruise at Lake Argyle. 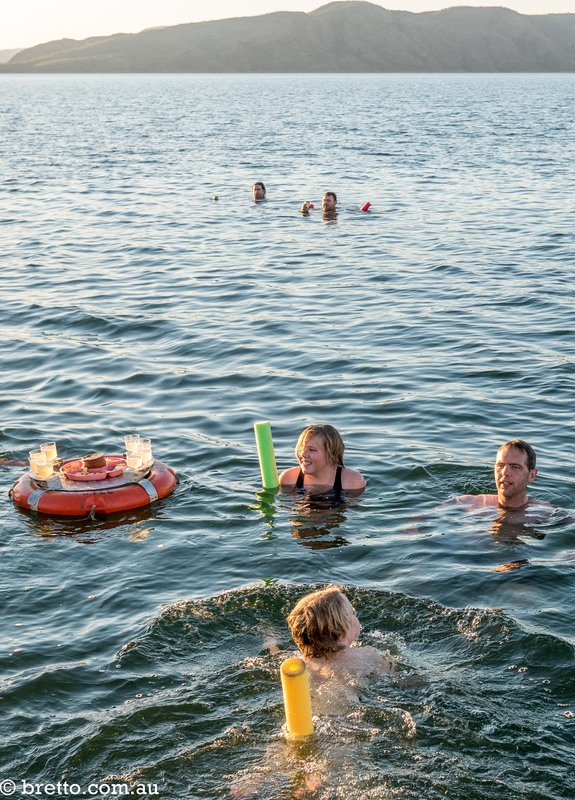 Note the life ring doubles as a floating dip and drink dispenser. 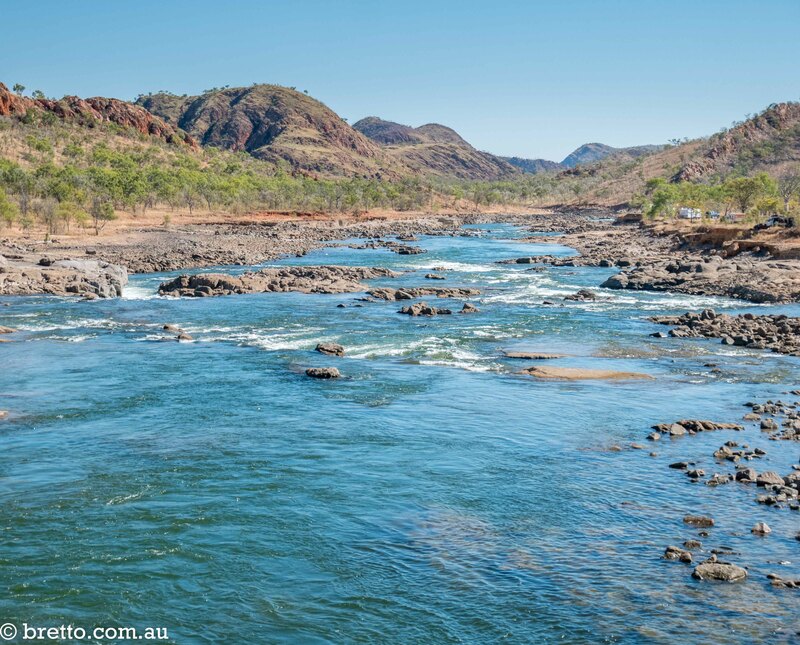 The Lake Argyle spillway reminded me of some rivers in New Zealand. 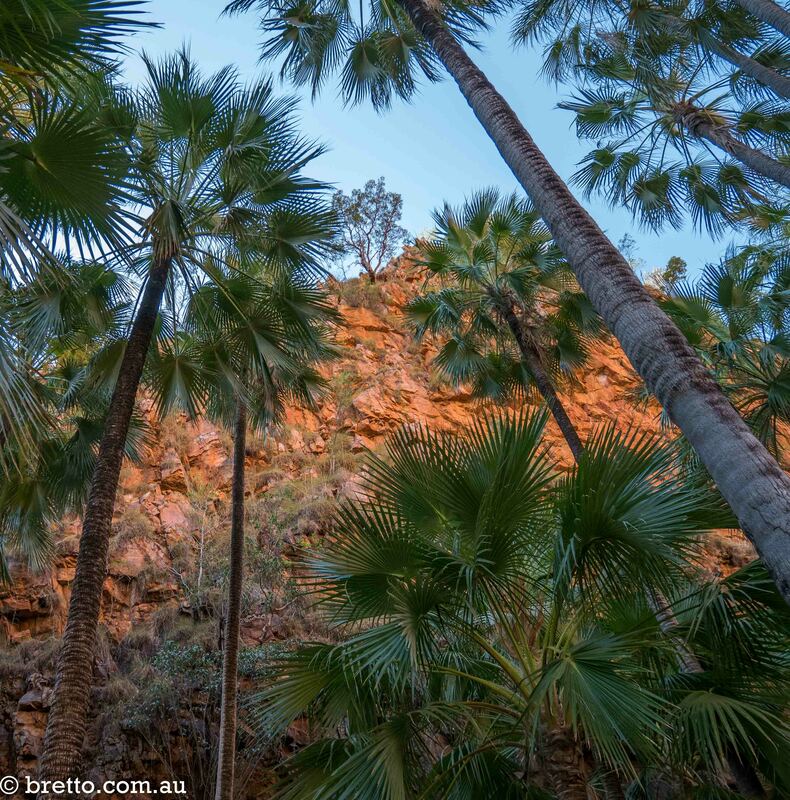 Towering palms at the start of the walk into El Questro Gorge. 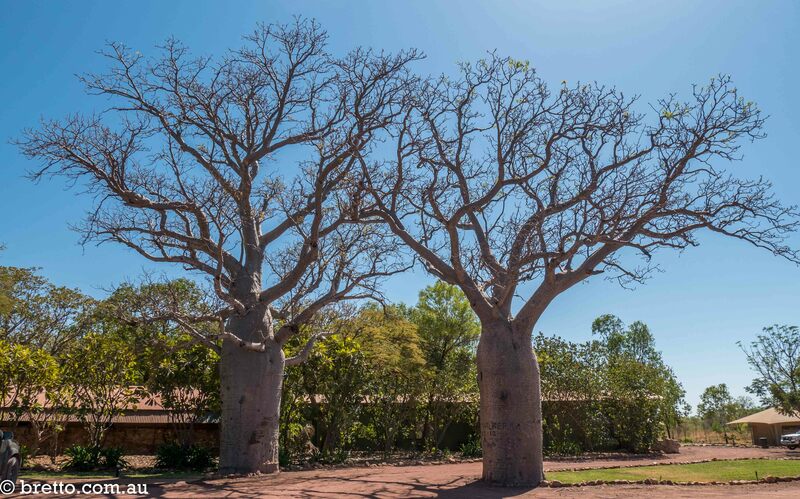 We stayed at the El Questro campground for 4 nights. 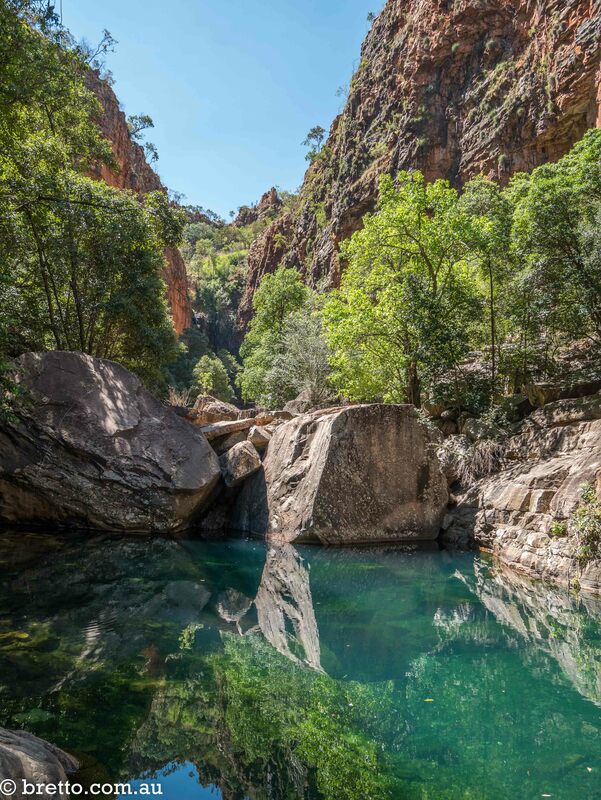 There are plenty of gorges to visit and walks to do. 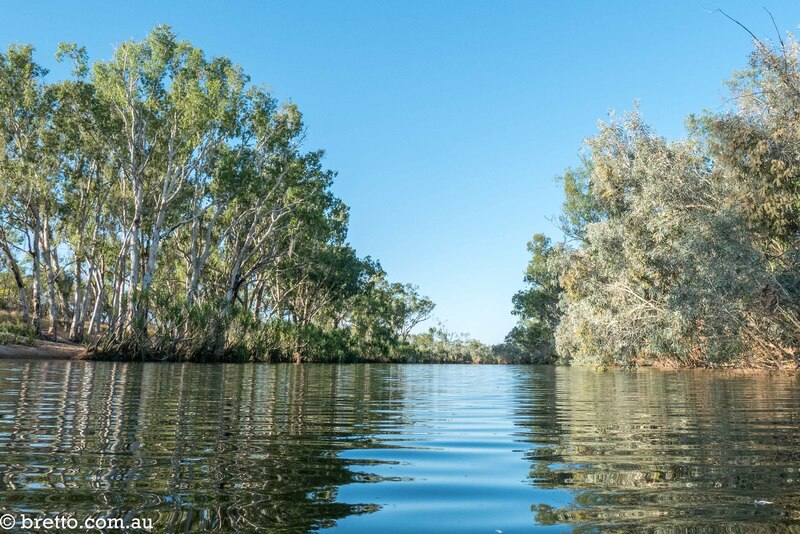 If you are planning on doing scenic helicopter flights and river cruises etc you might want to stay a bit longer. 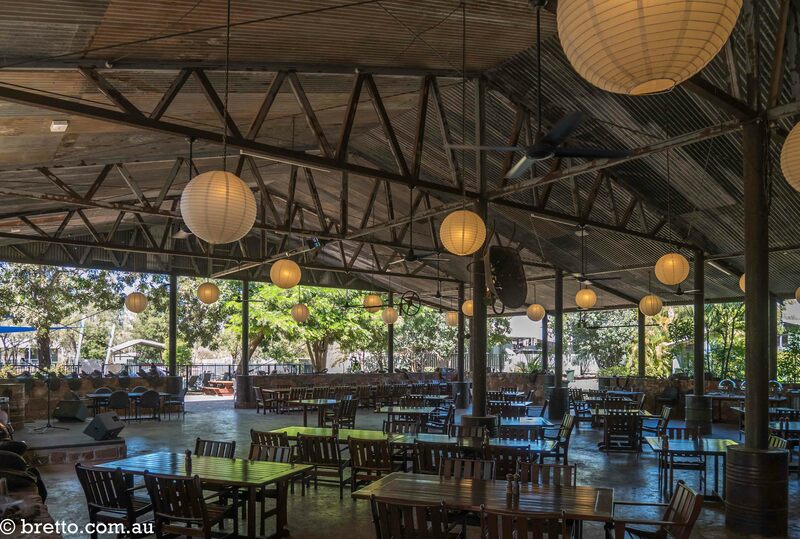 The meals at the Steakhouse restaurant were very good and not too expensive when you consider how remote it is. 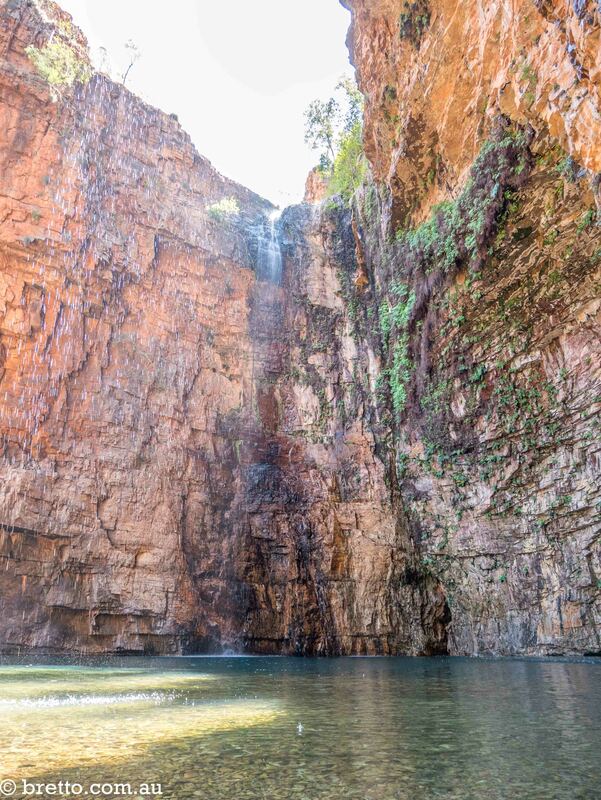 This is the half way point of the El Questro Gorge walk. 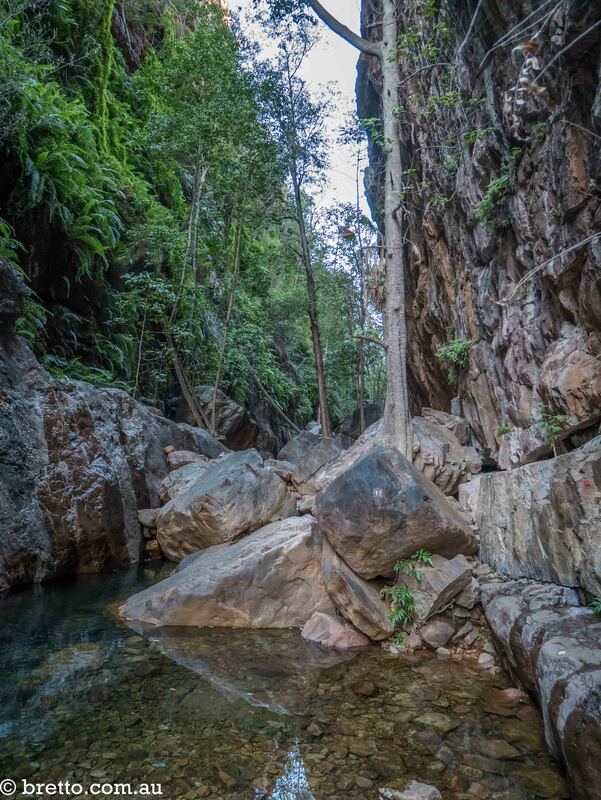 To continue further up the gorge you need to wade/swim through the water and climb up the rocks on the left or the small waterfall on the right. 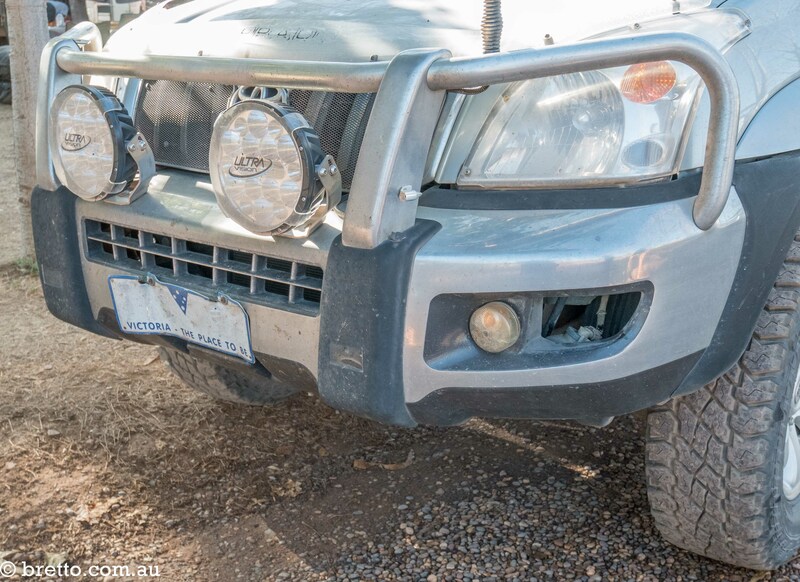 The first casualty – one of the Prado fog lights fell out. Luckily I never use them. 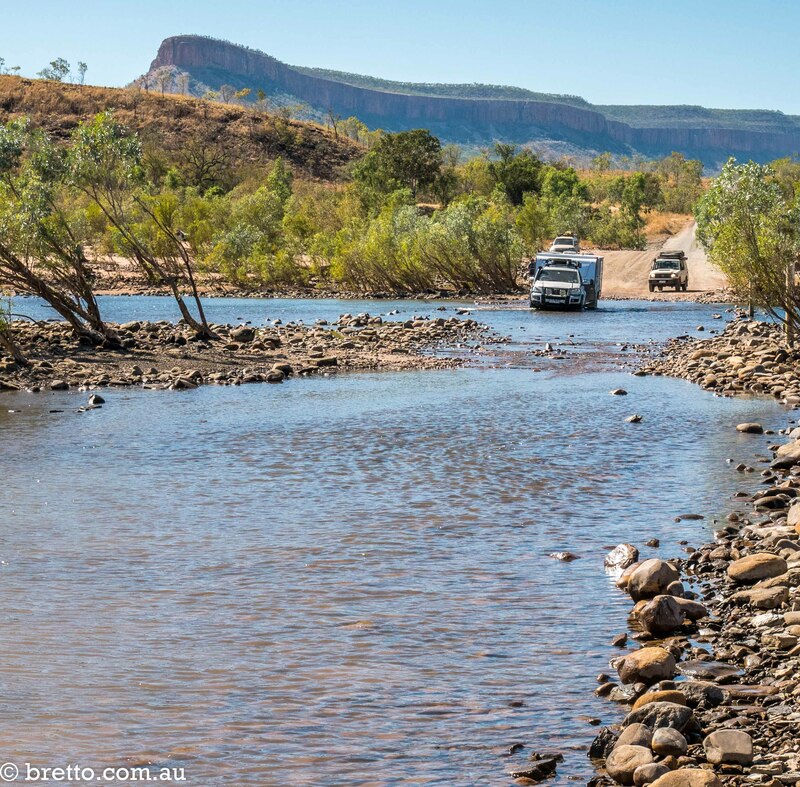 Crossing the Pentecost River on the Gibb River Road. The water was very shallow when we went through. We passed through Home Valley station for a quick look. 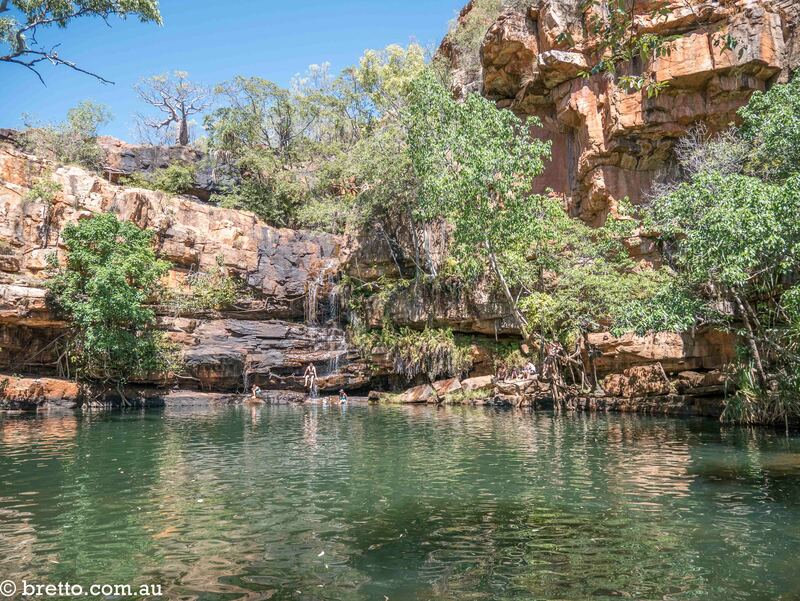 It had a pool and seemed quite nice but didn’t have the natural attractions of El Questro. 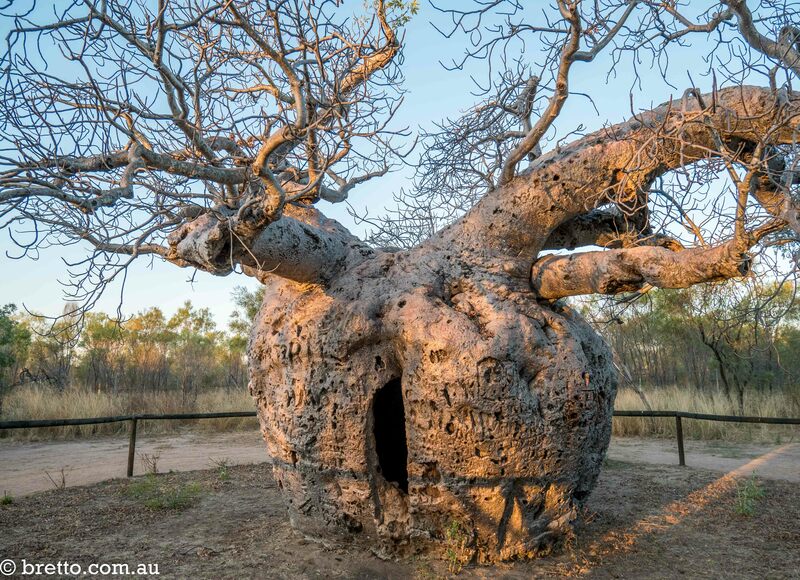 There are Boab trees everywhere in the Kimberley. Home Valley. 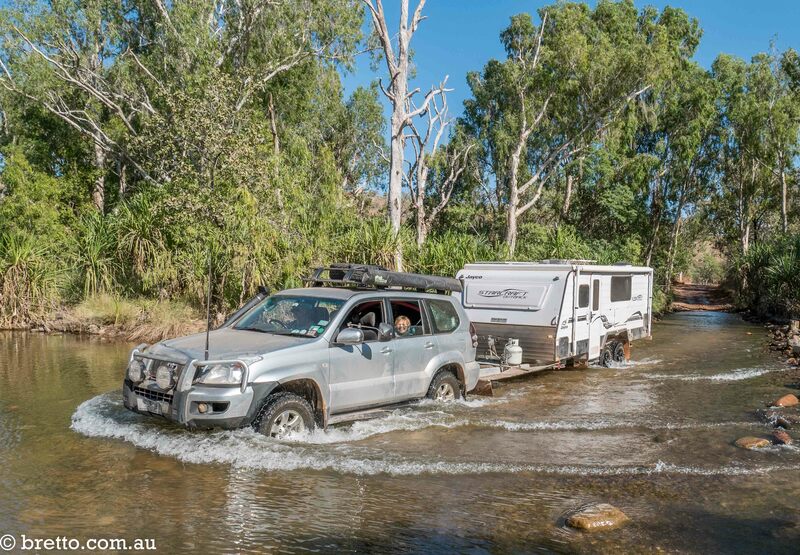 The GRR has a reputation of being quite rough and when you are towing a caravan you need to take it easy. At the time we went through there was about 130km of the GRR that was pretty unpleasant with speed at times dropping to 10-15 km/h. The condition of the road changes each year and depends on the when the road was last graded/maintained. 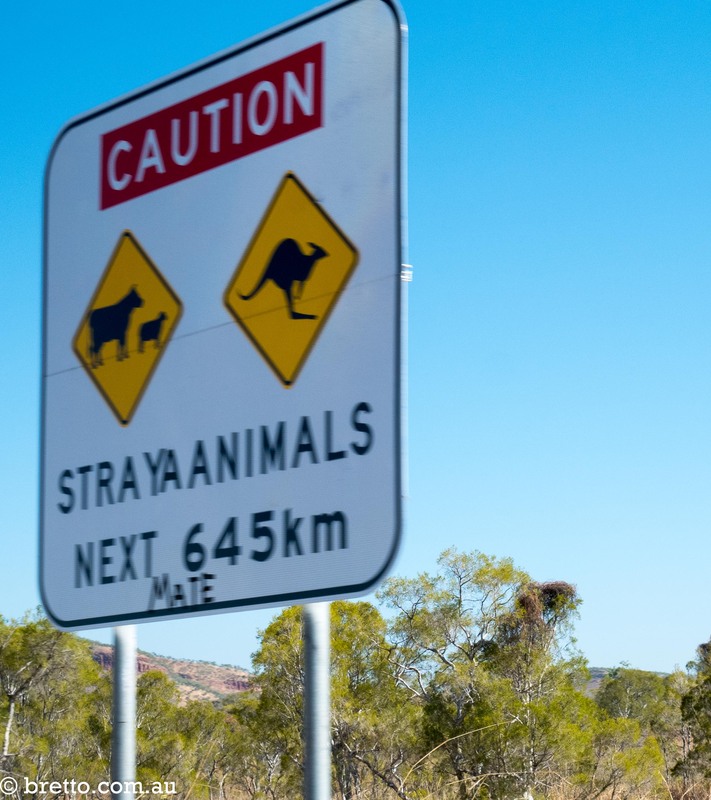 If you are driving a 4WD (especially a rental) and not towing, you could probably drive much of the road at 60-80 km/h. 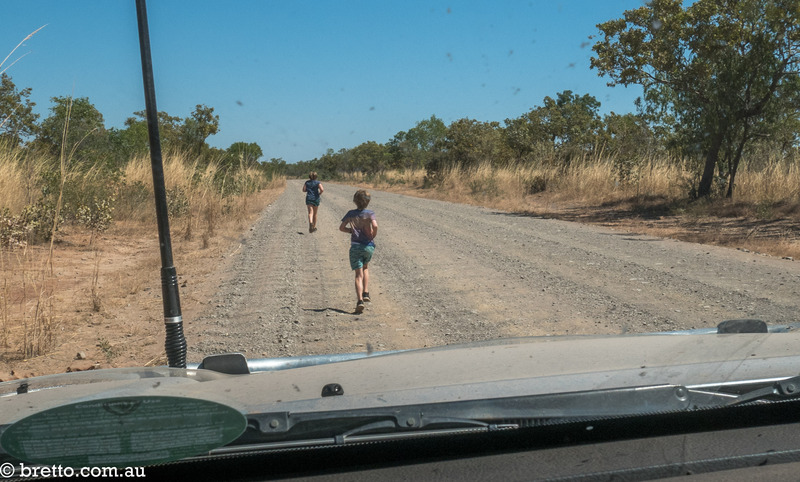 When the Gibb River Road got lumpy the kids could run faster than I could drive. Ellenbrae Station was a pleasant place to spend the night and is kind of famous for their scones. 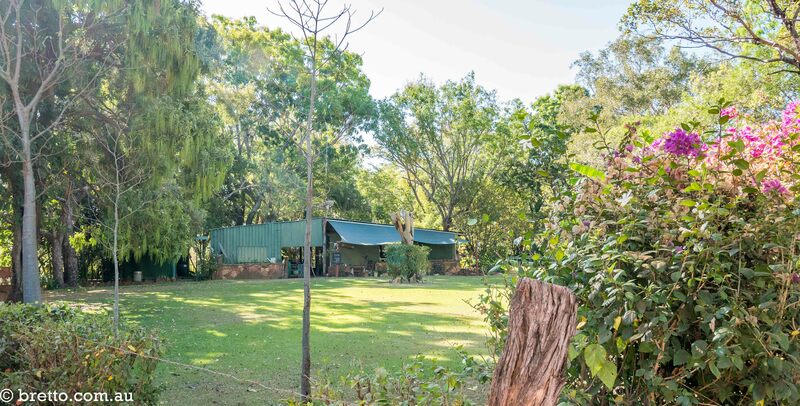 Note that the camping area is dusty whereas the homestead is nice and grassy (pictured above). 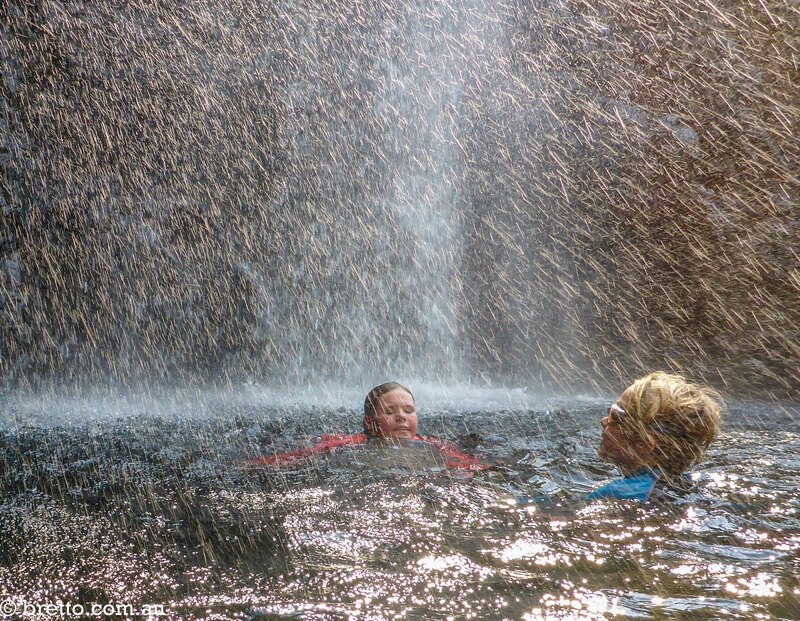 The swimming hole at Ellenbrae station was about 15 minutes drive from the campground. 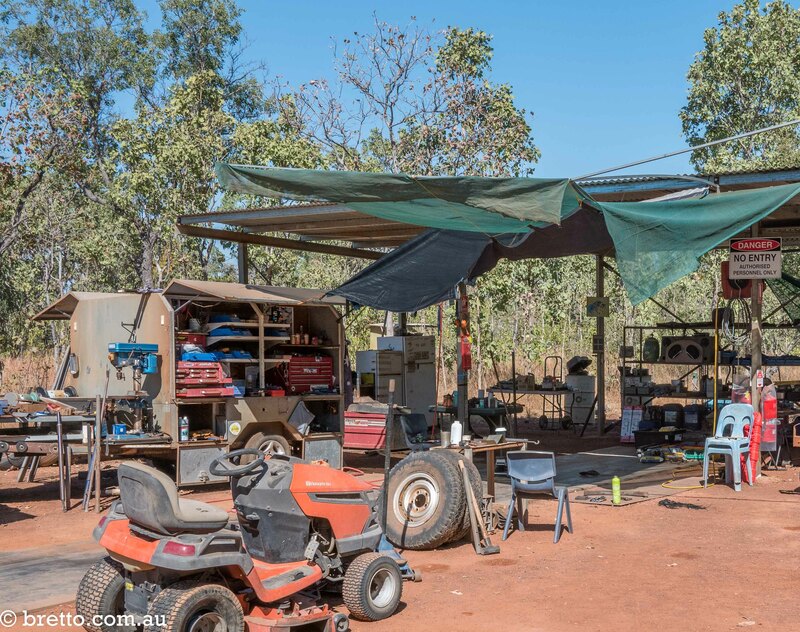 We started to have some concerns about the brakes…..
We were planning on taking the caravan up the Kalumburu Road to Drysdale River and then taking the Prado and the tent up to Mitchell Falls. 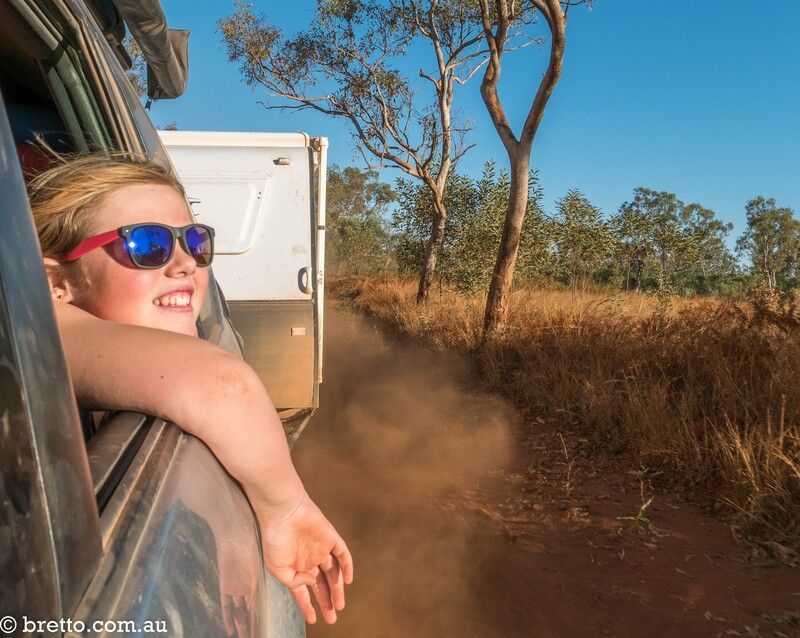 But having heard stories of the road destroying countless cars, camper trailers and caravans and with some concerns about our brakes we decided to leave the Kalumburu Road for next time…. 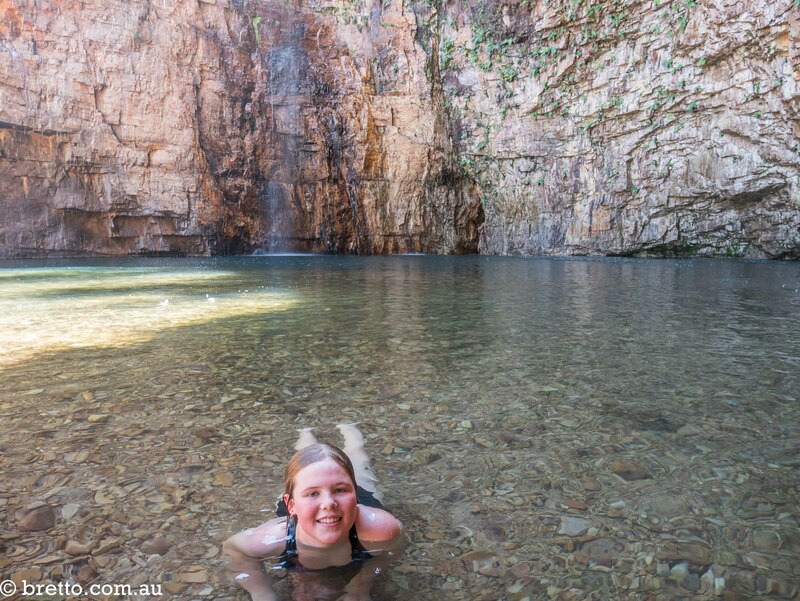 Manning Gorge was our favourite swimming hole. 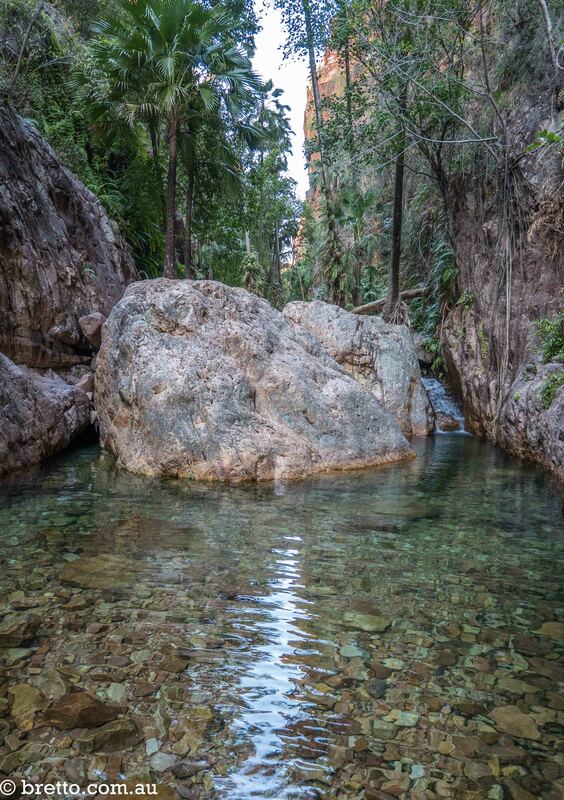 The gorge was about 45 minutes walk from the campground. We only stayed 2 nights but wish we stayed for 3. 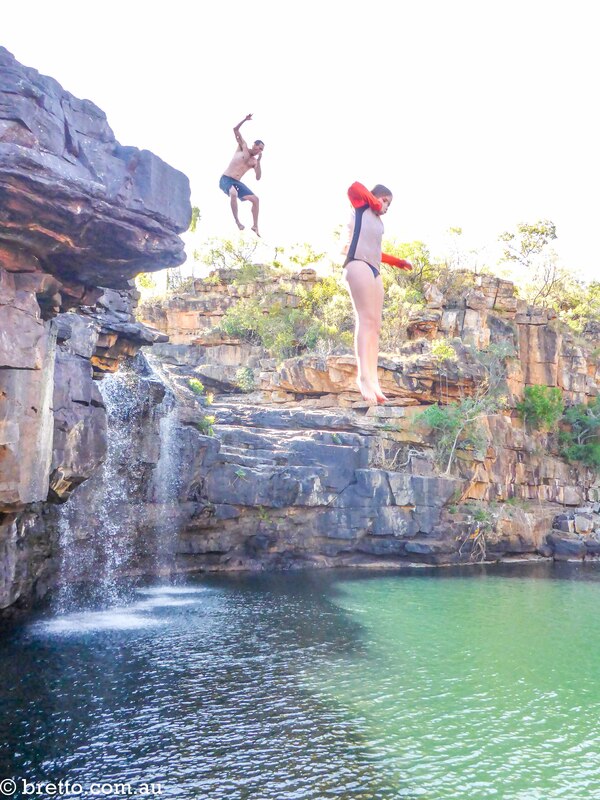 We spent hours swimming at Manning Gorge and jumping off the cliffs. 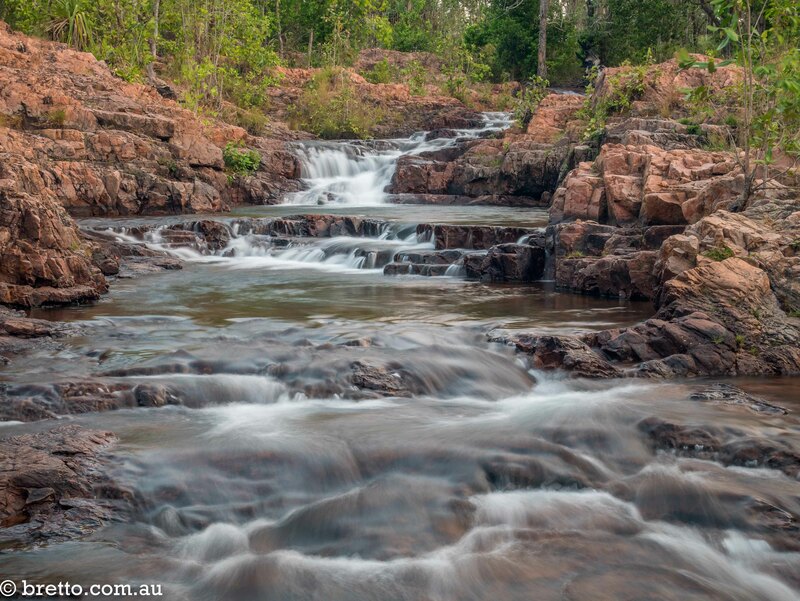 SAFETY WARNING: Make sure you check for submerged rocks and objects. 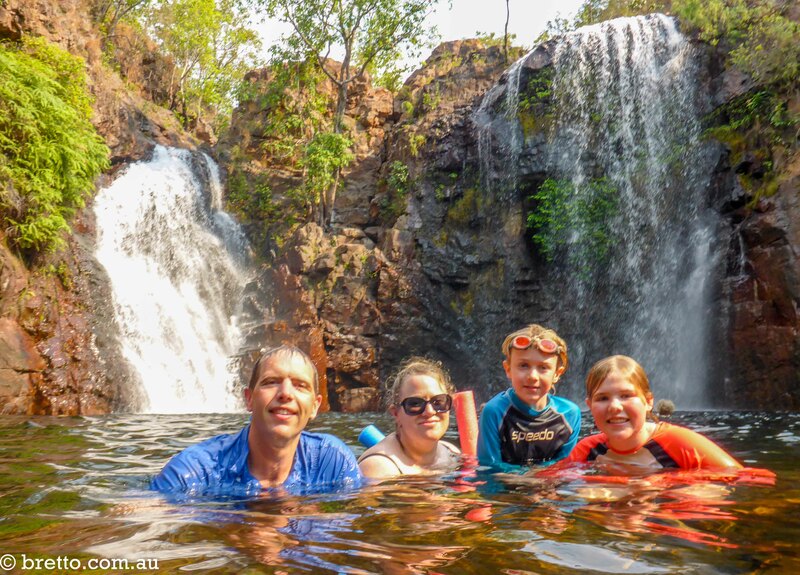 There is even a great swimming hole at the Manning Gorge campground – because you will want to cool off after the walk back from the gorge. 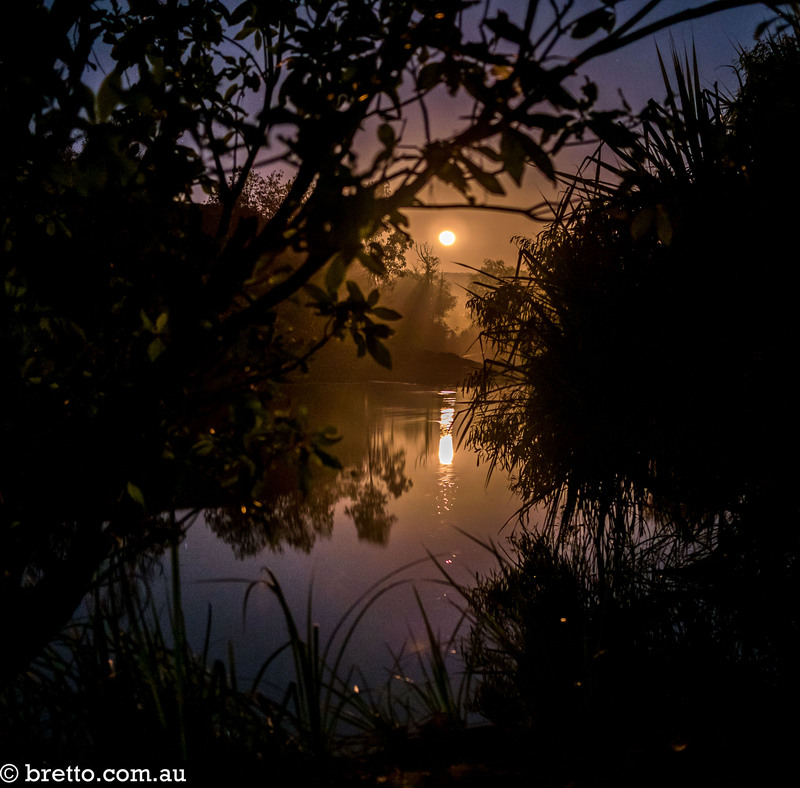 The track into the Manning Gorge campground. 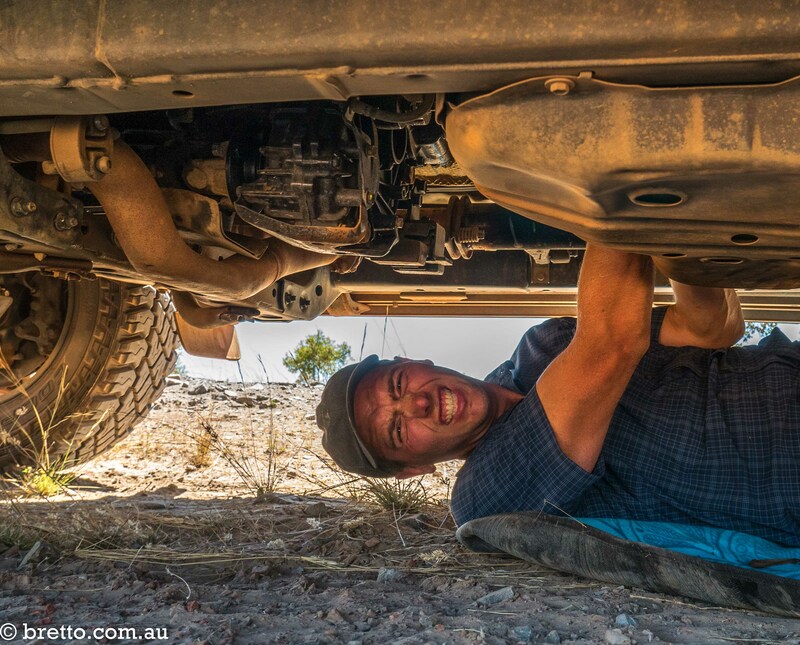 It was time to seek professional assistance on our brake problem – and the only mechanic on the GRR is Over the Range Tyre and Mechanical Repairs. We got great service at their open air workshop and the guys had us back on the road in an hour. 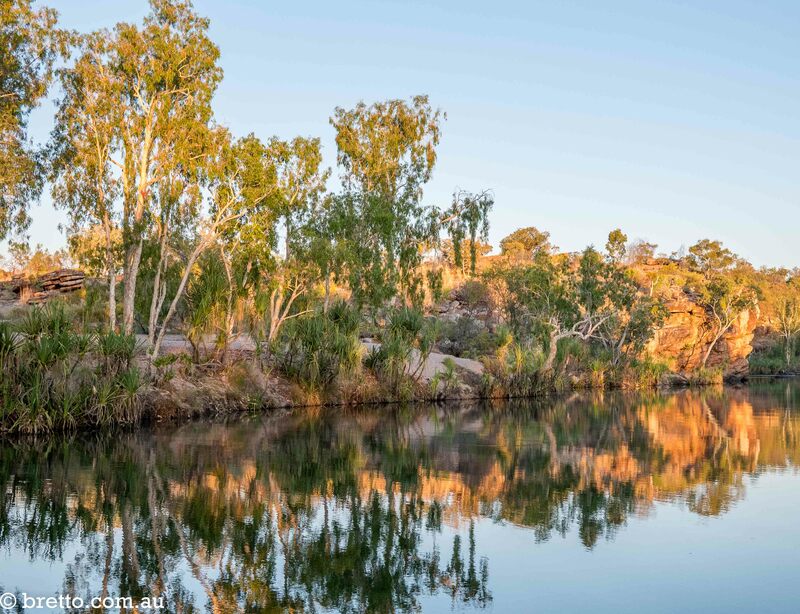 Galvans Gorge had a great waterhole with a rope swing which was very popular with the kids. 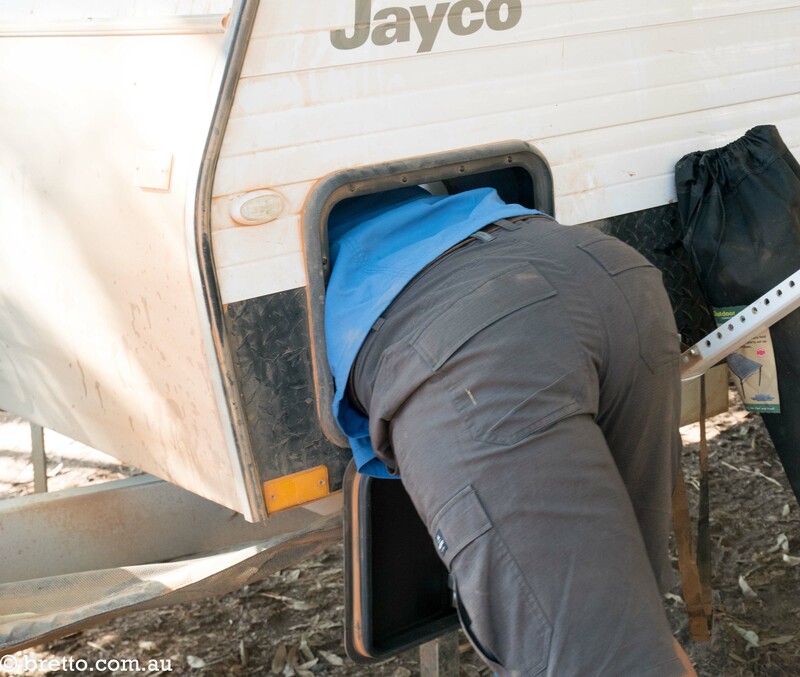 Our caravan has a “feature” known as a tunnel boot. It is a 2.4 metre wide storage locker with a small hatch on each side. It is not very ergonomic and I sometimes have to send the kids in get something out – but this time I had to butter up my shoulders and climb in myself. Tunnel Creek Cave. 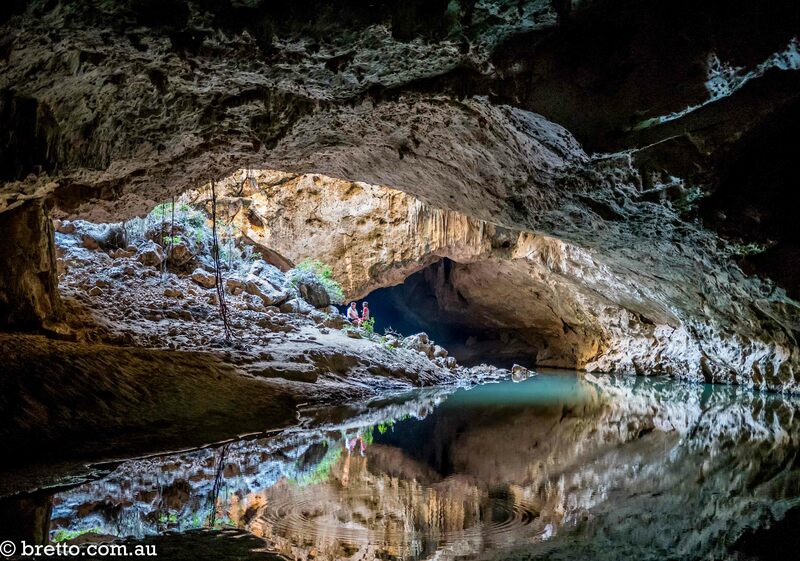 How does wading through a cave filled with bats and freshwater crocodiles sound? 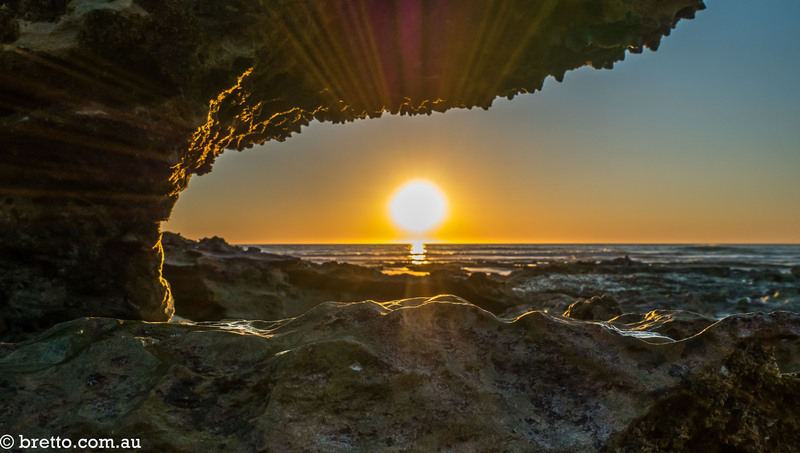 Sunset at Broome’s Cable Beach. There are 4WD’s as far as the eye can see plus a few adventurous tourists on mopeds and 2WD rental cars. 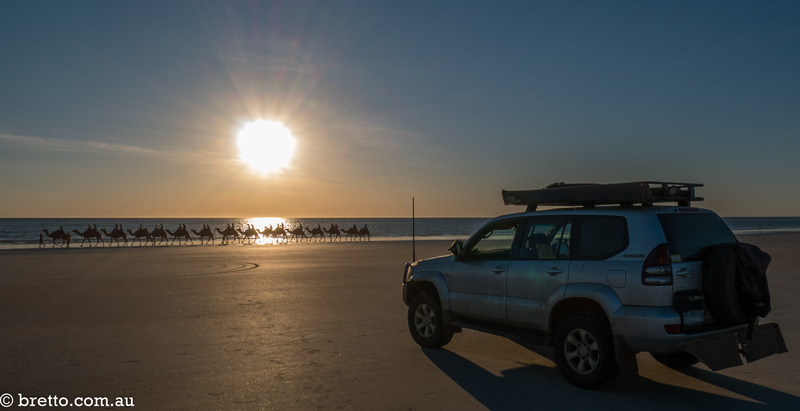 Access on and off Cable Beach is through a 1 lane bottle neck – and camels have right of way. This is what I call a CamJam. The sunset camel tours at Cable Beach are quite popular (I felt sorry for the young bloke working for one of the operators who had to follow the train and pick up the camel deposits). 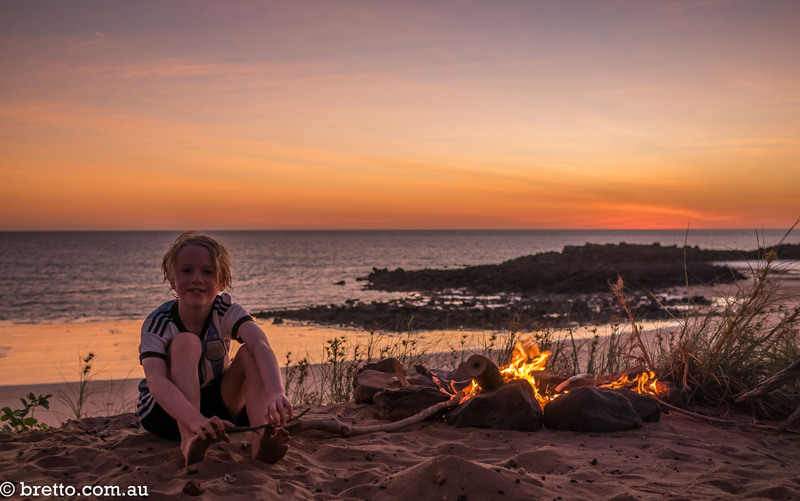 After restocking in Broome we headed up towards Cape Leveque and spent 4 very relaxing days at Middle Lagoon. Thanks to John and Pam for the tip on this great spot. We could sit at the campsite and watch the whales passing by. 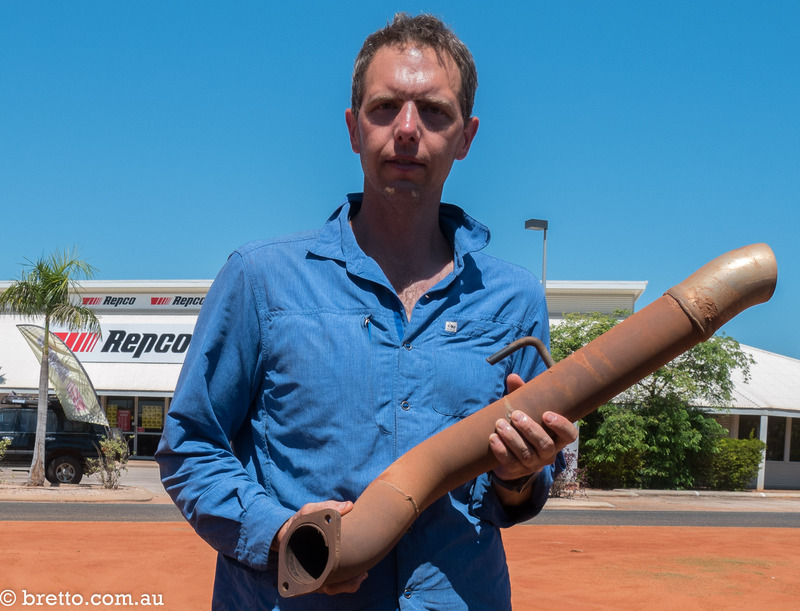 Not happy Jan…..The Cape Leveque Road worked its magic on my exhaust pipe so we had to stop in Broome and get some stuff to stick it back on. 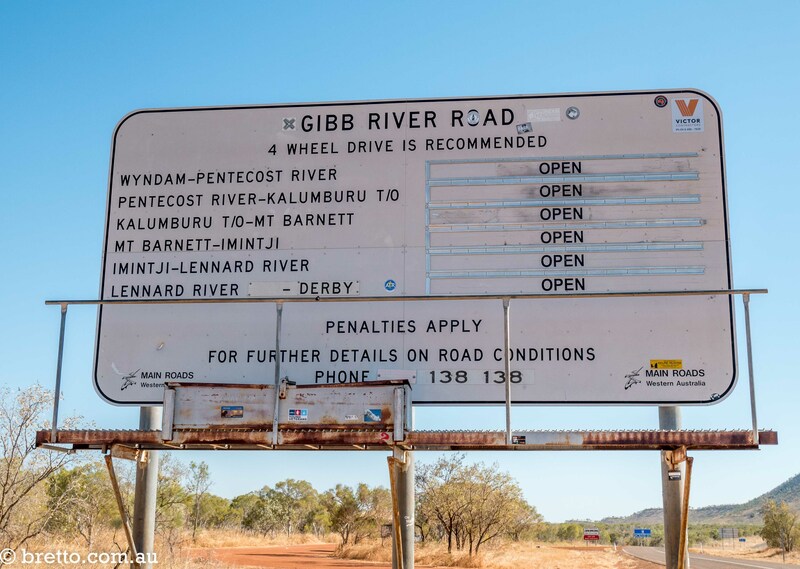 The trip is going well and we survived the Gibb River Road. 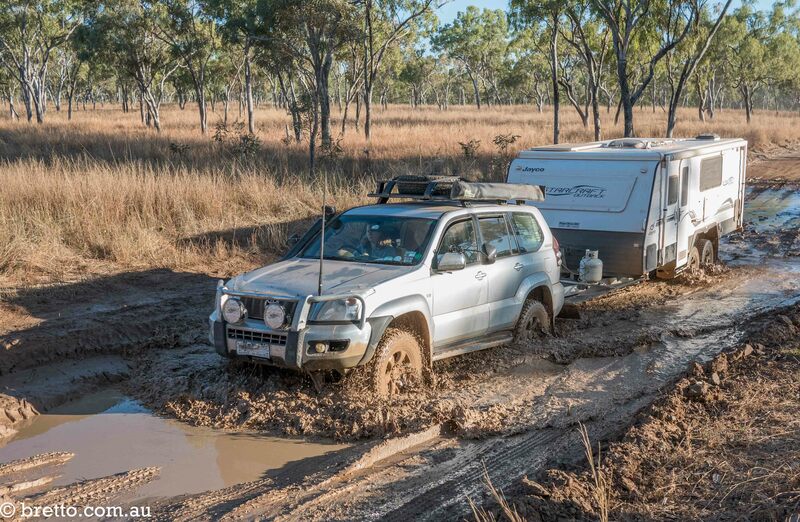 I thought the caravan would be our weak point but to my surprise it has been the Prado that caused us more trouble. 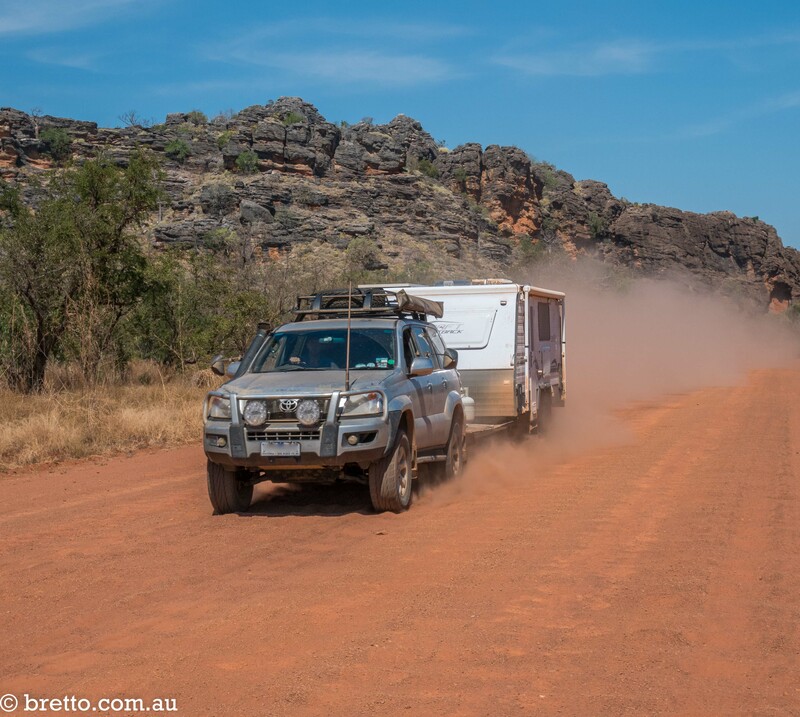 We have done about 9,000 kilometres so far and used 2,000 litres of unleaded. 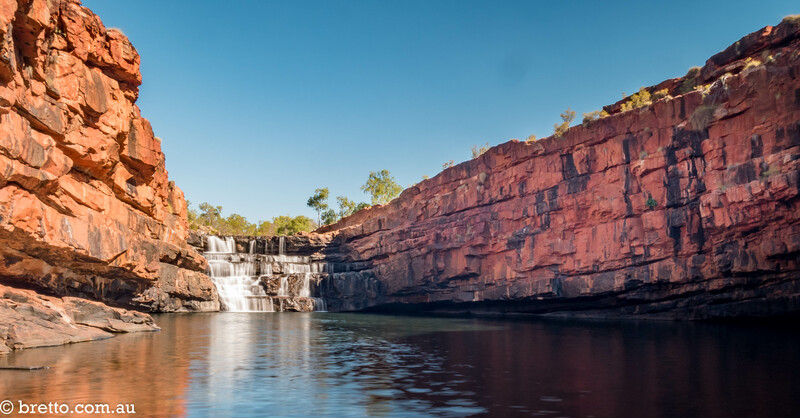 Stay tuned for my next post which will cover Karijini National Park and the Ningaloo Reef.